The Kids Arts Academy runs Monday to Friday ( excl. bank hols) 8.30AM to 5.30PM during all the school holidays from our Ofsted registered venues. Art, Animation and Cooking Club for children aged 4 to 14 yrs. See www.kidsartsacademy.co.uk to book online and download the activity timetables. 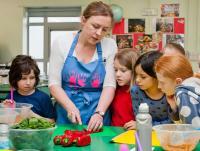 The Kids Arts Academy provide Ofsted-registered Holiday Clubs in Art, Animation and Cooking which are brilliant fun and run by professional DBS-checked staff. We've been operating since 2008 and are open every school holiday from Monday to Friday, 8.30am-5.30pm (excluding bank holidays). We provide high quality, creative activities that give children the opportunity to learn and develop new artistic, animation and cooking skills in a stimulating, fun, inclusive environment. At our holiday cooking clubs we create one sweet and one savoury dish every day; in the art group we do a morning and an afternoon artistic activity; and children in the animation group create one film each day in small groups. We run different activities each day and parents can book for a morning or afternoon session or mix and match their choice of activities on as many days as required. Everything the children make is taken home at the end of every day - delicious cooking is taken home for their dinner, beautiful artwork is taken home to share and animation is taken home on a DVD. Children can be accommodated in sibling or friendship groups but we also have lots of children that come on their own and make lots of new friends. We pride ourselves on making sure all children have a wonderful time. In our cooking groups we use meat-free recipes and can cater for special dietary requirements such as wheat and dairy intolerance's. Both of our venues were inspected by Ofsted in 2013 and received their stamp of approval. As a childcare provider on the Voluntary Childcare Register it is only possible to receive a pass or fail. Both inspections were a really positive experience and on both occasions we passed successfully. For more information or to book online, please visit: www.kidsartsacademy.co.uk or email bookings@kidsartsacademy.co.uk with your questions. We have been working with SNIPs for the past 7 years and find our activities are really well suited for children with Autistic Spectrum Disorder. We have children from a wide range of backgrounds. Early drop off from 08:30 @ £8.25 per day. Late collection up to 17:30 @ £15.50 per day. Employer Supported Childcare Vouchers accepted. We take children from the age of 4. Where a child is not yet in full time education, we are happy for them to attend a half-day session only.